Tony Criswell's dribbling is among the issues troubling the Tigers these days. OK, clear your head and repeat after me: The Missouri Tigers will not make the NCAA tournament. They will lose in the first round of the SEC tournament, make a nice run in the NIT and then talk about how next year will be better. Good. Now that your expectations have been lowered to a realistic level, you can kick back and enjoy the rest of the season. Because if you harbor hopes that the Tigers will do more than that, you’re asking for disappointment. You’re very likely to spend the next two months yelling at Jordan Clarkson to pass the ball, urging Ryan Rosburg to use his size so every other layup isn’t blocked, pleading for Wes Clark not to shoot, cringing when Tony Criswell tries to dribble and cursing coach Frank Haith for, really, no good reason. For whatever reason, it has been difficult to get an accurate read on these Tigers. Maybe the success of the football team somehow fostered a belief that the basketball Tigers also would be better than we thought. Maybe their impressive victory over UCLA — which, remember, was really an impressive second half — raised hopes to an unrealistic level. Certainly, cracking the Top 25 and losing only once in non-conference play led us to believe that this would be a special season for the Tigers. Now we should know better. Now we should realize that the home loss to Georgia wasn’t due so much to a lackadaisical effort. And maybe the loss to Illinois was about more than a couple of mistakes in the final minute. Surely, their 12-1 non-conference record had more to do with the (lack of) quality in the opposition than we thought just two weeks ago. 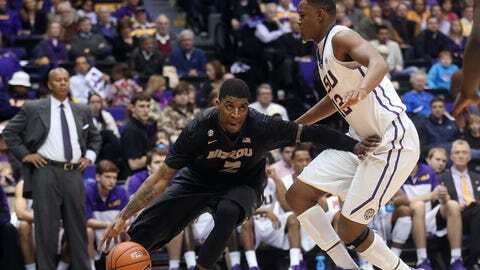 Now we should know that the Tigers are pretty much what they showed Tuesday night in a 77-71 loss at LSU. They’re not bad. They’re not great. They’re good and possess the potential to improve, but not enough to become a force on a national level. In other words, they’re about what the experts predicted in the preseason: A fifth-place SEC team. We shouldn’t be surprised, either. This is, don’t forget, a team that returned only one starter, Jabari Brown. One-and-a-half if you count Earnest Ross’ early-season starts in 2012-13. This is a team starting a freshman, Johnathan Williams III, and a previously little-used sophomore, Rosburg, in the frontcourt. That’s not exactly DeMarre Carroll and Leo Lyons, or even Laurence Bowers and Alex Oriakhi. This is a team breaking in a new point guard, Clarkson, who, out of necessity, is playing out of position. This is a team with a freshman, Clark, as its backup point. This is a team whose top big man off the bench, Criswell, can’t seem to figure out he’s on the floor for energy and rebounding, not outside shooting and dribbling. Finally, the Tigers are a team with a backcourt as capable as any, a frontcourt with a ways to go and a bench that, at best, can hold its own against opposing backups. They lack the experience of Florida and the athleticism of Kentucky. Once you get past those teams, it’s about a 10-team scramble for third place. If the Tigers want to separate themselves from that pack, their chance is coming soon. After playing host to South Carolina (0-4 in conference) Saturday afternoon, the Tigers face what should be their most telling stretch of the season: at Arkansas, home against Kentucky and at Florida in a span of eight days. Win all three and the Tigers not only will have emerged from the also-rans, they will have proven me wrong. I wish them luck, but I’m not counting on them winning more than one of those three. It’s more fun to be surprised than frustrated.